Skills and abilities: All forms Martial Arts dating back 3000 years. 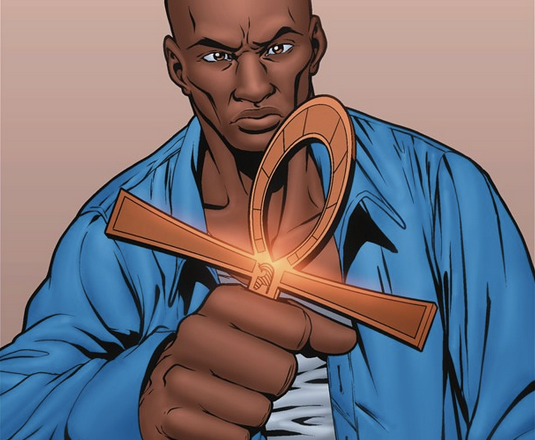 Powers: Super strength, the ability to Morph his Ankh into any weapon he can think of and the power to create Illusions. Elijah Alexander grew up poor and always on the move with only his mother, Mariah, in his corner. But through drive and determination, he became a New York Assistant District Attorney. As a brash, media-hogging ADA, he made his mark by dismantling every major crime syndicate in New York in only six months. Elijah’s goals include a corner office at NY’s most powerful law firm and his face plastered across all media. But now that he’s become aware of his true calling, can he turn his back on his dream and accept the responsibility placed before him? Make sure and pick up the whole series! It will pleasantly surprise you!